Audio podcasts of the events at the Boston Book Festival are now online – along with some videos. Whether you were one of the 25,000 attendees or not, you can catch some of the 2010 festival via the Web. The panel that I was on, “The Novel: A Prognosis,” can be heard right here. I’ve recently returned from a great trip to Mexico City. 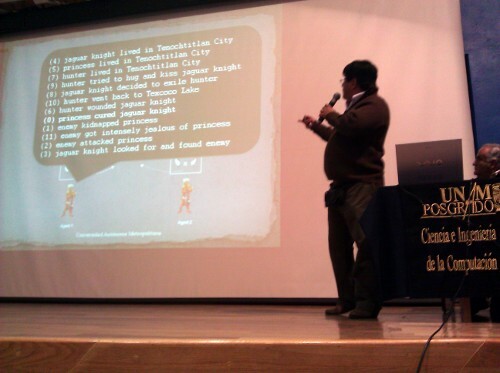 I was at the 5th Mexican International Colloquium on Computational Creativity presenting alongside two other foreign guests, Graeme Ritchie and Dan Ventura, and two local researchers, Rafael Pérez y Pérez and Eduardo Peñaloza. There was a productive and lively roundtable on interdisciplinary work and collaboration the day before the talk, too. Rafael Pérez y Pérez, a collaborator of mine, arranged the colloquium and was a very gracious host, making sure that we got to and from the airport, to all of the colloquium events, and to several excellent meals. Rafael presents the collaborative version of the plot generator MEXICA. 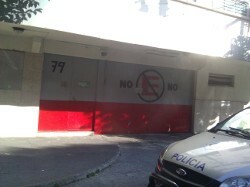 They must love George Perec's La Disparition in Mexico City. I have a few things to mention about the 5th MICCC, but I’d like for this post to be mainly forward-looking rather than backward-looking. That’s because ICCC-11, the 2011 International Conference on Computational Creativity, is an event on the same topic as this recent colloquium, and it will be taking place in the same city thanks to the local organizing work of our wonderful host, Rafael. Although the colloquium was intellectually rich and I enjoyed visiting Mexico City for its own sake, I was also very pleased because I was anticipating this larger-scale academic gathering that will be taking place April 27-29. In part, I was reminded of the conference because I and the other organizers, Rafael, Graeme, and Dan, spent a good bit of the time working to make the remaining decisions and to prepare for ICCC-11. But even just walking around the city, I had in mind how much other computational creativity researchers would enjoy coming to México. 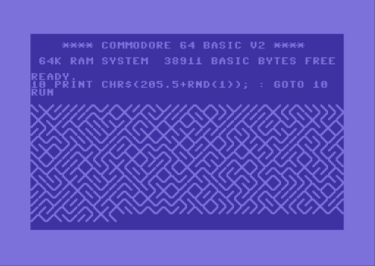 The C64 BASIC program executing. This one-line program is the focus of a deep investigation that I am undertaking with nine other authors. We plan for this study to result in a single-voice academic book – not an edited collection, not a “chapter book” with separately authored segments, but something that reads like a single-author book but is written by ten people. We are still in the early stages of writing this book, but it’s our hope that 10 PRINT CHR$(205.5+RND(1)); : GOTO 10 by Nick Montfort, Patsy Baudoin, John Bell, Ian Bogost, Jeremy Douglass, Mark Marino, Michael Mateas, C. E. B. Reas, Mark Sample, and Noah Vawter will be published by the MIT Press in 2012. (Yes, the book’s title is the program itself.) Since the colloquium focused on interdisciplinary work and collaboration, this seemed like a nice project to discuss, even though the ten of us working on this project are not trying to model the creative process using computation. I described how the study of this program shed additional light on the relationship between platform and creativity, and how it suggested that computational creativity models try to take into account that relationship. This poster was in the lobby of the auditorium where I did my presentation. Looks a bit like the output of 10 PRINT, no? It seems to show just that with two other characters (a horizontal line and a vertical line) thrown into the mix. The other talks offered some excellent descriptions of and discussions of computational creativity systems: MEXICA, DARCI, and STANDUP (along with its predecessor, JAPE). These systems, and the things that have been done with them, are all great examples of creative computing, by the way, in addition to being computational investigations of creativity! I could do a post this long covering just the new thoughts that have come to me about these projects, each of which I knew about before. For now, I’ll refer you to the abstracts and links for more on those projects. 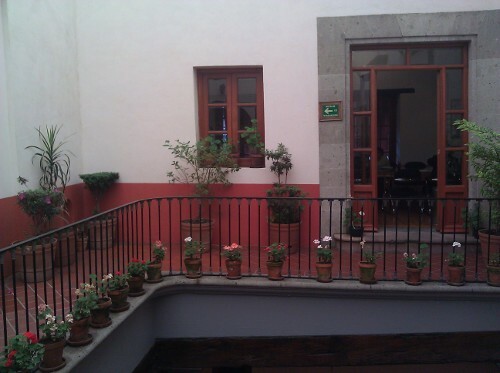 Interior of La Casa de Primera Imprenta. I’ve been to Mexico City before, but this was my first trip to the city’s main square, the Zócalo. This is the area where ICCC-11 will take place. It’s an amazing sight. You can see that Mexico City is mind-bogglingly big as you fly in, but the Zócalo is massive in a different way. The plaza and the area is human-scale (designed for pedestrians and very walkable, with many shops and restaurants) while also being tremendous and impressive. On the north is the cathedral; the National Palace, where President Calderón works, is to the east. An enormous Mexican flag flies from the National Palace during the day. To the west are several buildings, including the Best Western Majestic Hotel, which will be offering a discounted rate for ICCC-11. Just off the plaza, between the Cathedral and the National Palace, is where ICCC-11 will be held – at La Casa de la Primera Imprenta. The first printing press in the Americas was installed in 1536 in this building. It now offers a conference facility of just the right size for ICCC-11 presentations and demos, several galleries, and a bookstore. 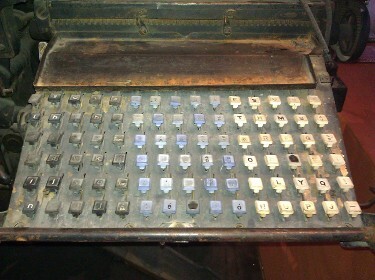 SHRDLU fans will note that the Linotype machine in La Casa de Primera Imprenta has a different layout than an English Linotype machine. The Autonomous Metropolitan University, Cuajimalpa is the host institution for ICCC-11, which is also supported by UNAM’s postgraduate program in computer science and engineering. The colloquium that UAM-Cuajimalpa put on with UNAM was well-attended by students and faculty who had some good questions for us. I know that we will have great local arrangements for ICCC-11; the participation we had in the colloquium suggests that we will be part of some good conversations (and, no doubt, see some good presentations and demos) from local ICCC-11 attendees. 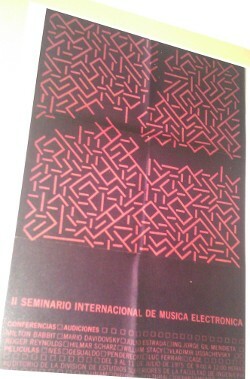 So, I hope to see you readers who work in computational creativity in Mexico City at the end of April. I’m the publicity chair for ICCC-11, but in addition to publicizing the conference, I’m glad to email with anyone who has questions about the conference or about visiting Mexico City. And, remember that the deadline for submissions (of short papers, long papers, or show-and-tell proposals) is December 13, less than a month away now: The call for papers has the details, and there is more information on other parts of the ICCC-11 site. My collaborator and publisher William Gillespie has a new book, Keyhole Factory, and has done a vigorous interview about it which I suggest you read. The Curveship Codefest today was all I hoped it would be – a source of ideas, a way to discuss how to progress toward release, and even a time for the development of several fiction files (games) and spin files (specifications for narrating), some profound, some amusing, some both. I have received some very useful patches, representing the first contributions to the core Curveship code from others since I started this project in 2006. It looks like – with some serious work on my part, and with further consultation from the Curveship cognoscenti – Curveship can finally be ready for release in a few months. I want to thank everyone who participated in the codefest today, from Amaranth to Zarf. So I will: Thank you, Amaranth, Angela, Brad, Doug, Jake, Jason, Kevin, Luis, Flourish, Fox, Ralph, and Zarf! Communities represented at the fest included the Boston area IF community, MIT’s Programs in Writing and Humanistic Studies and Comparative Media Studies, and the MIT Media Lab. In particular, thanks to Flourish for breakfast and lunch food for everyone; thanks to Zarf for the cookies; thanks to Amaranth and Brad for the donuts; and thanks to Fox for suggesting the event in the first place. Thanks to all who came by to the Tuesday book release party for Riddle & Bind at Grafton Street. Riddles were pondered (and some solved) and many good times were had. Jason Scott stopped by, driving up from his archival compound in New York State! Recently kickstarted Andrew Plotkin (a.k.a. Zarf) was there, too. Fiction writer Ralph Lombreglia, my mentor from Boston University, was one of several current colleagues from MIT’s Writing and Humanistic Studies who stopped by despite their teaching and event schedules – thanks as well to Bill Corbett, Ed Barrett, and Magdalena Rieb. All right, enough shout-outs for now. I do appreciate all of you who were able to come by and celebrate the publication of Riddle & Bind. Remote readers can find the book for sale via Spineless Books (my very dedicated publisher) or Amazon. As my very crummy photo shows, Dave Lebling joined us (the People’s Republic of Interactive Fiction) at MIT yesterday for a productive play session of his game The Lurking Horror. (We got 55 of 100 points, which isn’t bad for three hours, even if some of us who’d solved the game did nudge the others along now and then.) Afterwards, we went on a tour of MIT, checking out some of the locations that inspired those in Lebling’s game. In other great interactive fiction news, a Kickstarter project by Andrew Plotkin, a.k.a. Zarf, was fully funded almost before one could type “transcript on.” Zarf has promised to write Hadean Lands, an IF game for the iPhone, and to work on other IF-related projects. You can still donate money to support Zarf’s work.